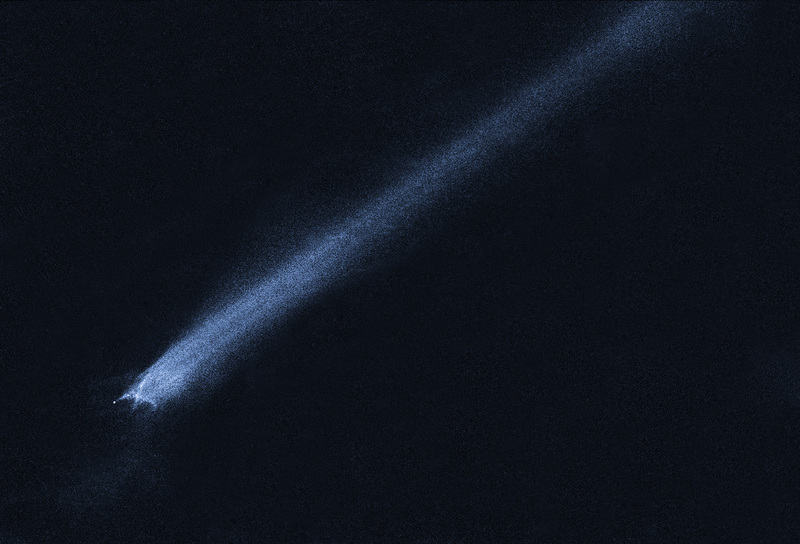 With a long trail of material streaming out into space one would assume this to be a photo of a comet…but it’s not. Rather, it’s believed to be the result of a collision between two asteroids that produced a weird X-shaped pattern of filaments emanating from a small remnant object. Material from the filaments has since been blown back into space by solar radiation. Unlike their science-fiction movie counterparts, asteroids rarely encounter each other…but when they do the results can be impressive. Colliding at over five times the speed of a rifle bullet, asteroids can literally blow each other to bits. It’s been theorized that the asteroid belt is slowly being worn down by impacts but this is the first time the result of one has been seen directly. Read more on the Hubble site here. UPDATE: Later observations with Hubble from January to May 2010 showed that the comet-like tail expanded very slowly, indicating that the collision itself likely occurred early in 2009…a high-speed collision between a 400-foot-wide object and a 10 to 15-foot-wide object with the force of a small atomic bomb. Read more here.